We’ve all heard how important it is to start the day with a healthy breakfast. In fact, many of us have vivid memories of our parents telling us exactly this when we were children, yet as adults with harried schedules, we can often neglect this critical meal. Starting the day off right is important for everyone, but even more so for people in recovery. So, why is it so important? As we know, a healthy recovery plan is one that aims to provide a balance. We can better control mood swings and cravings when we keep our basic physical needs in check. This means getting enough sleep, getting enough exercise and getting enough and the right kind, of fuel for our bodies. Irregular eating habits can contribute to erratic mood swings which, as we know, are also closely related to cravings. There are other benefits too: eating a healthy breakfast helps boosts brain power and improves productivity. It helps us focus on our tasks with better concentration and efficiency. Consider that by the time you wake up your body has gone without food upwards of 12 hours or more. Is it any wonder then that your body needs to refuel before the start of an active day? In addition to boosting your brain power, eating a healthy breakfast promotes a more positive attitude and a better overall nutritional status. It may also be an important factor in helping to maintain a healthy weight. In fact, studies confirm that people who don’t eat breakfast have metabolic rates on average 4 to 5 times below normal. As a result, a person who skips breakfast may gain 1 pound every seven weeks or about 8 pounds a year! Persons counting calories in an attempt to lose weight may be tempted to skip breakfast in an effort to reduce calories, but it can in fact have the opposite effect. The National Weight Control Registry reports that 78 percent of people who are successful at maintaining their weight loss long‐term, eat breakfast everyday (1, 3, 5). So, the next time you are tempted to skip breakfast as a strategy to lose weight, think again! 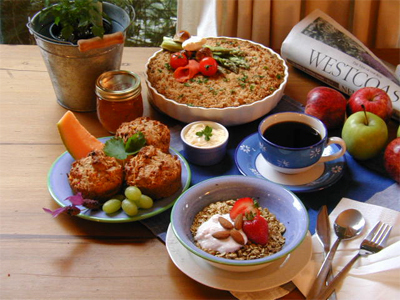 That being said, a healthy breakfast doesn’t have to be time consuming or lack flavour‐appeal. Consider these easy‐ fix options to start your day off right. Get creative and add some spice to your breakfast menus with these slimming strategies (2, 4, 5). Choose a smarter cereal or create your own signature cereal by combining several of your favorites. Puffed cereals are naturally fat free, sugar free and sodium free and a generous serving of 1 cup, only contains 50 calories. If you usually have cold cereal, give hot whole grain cereals a try. Oatmeal is a good choice. It is fibre rich and will keep you feeling fuller longer, and has the added bonus of helping to lower your cholesterol, and its carbohydrates release slowly into the bloodstream, helping to keep cravings from coming on too fast. There are many unsweetened varieties of cereals available that when topped with fruit and a pinch of cinnamon can add enough oomph for the taste buds. Don’t forget to use skim or low fat milk. Settle for a single spread. Using an all‐ fruit spread instead of butter or margarine or a combination, can save as much as 5 grams of fat (45 calories) for each teaspoon you use. Top pancakes or waffles with no‐fat toppers like no sugar added fruit spreads, reduced calorie syrup, fresh fruit, fat free cottage cheese or fat free yogurt. Pass on the breakfast breads and pastries. Muffins, croissants, donuts, biscuits and cinnamon buns should only be occasional indulgences. Be careful of non fat varieties when you do indulge as they tend to contain more sugar or fat replacements that add more calories than the regular variety. Give yourself a fibre boost. Choose whole grain breads and a grapefruit half instead of juice. They fill you up for longer. Pour 1 cup puffed wheat or rice cereal in a bowl. Top with one of the following and eat sundae‐style or stir just before serving. My answers:1. If you could have any dish made for you by a top chef what would you pick?? Anything Jamie olevir would like to make me :)2. If food had no calories or fat what would your favorite dessert be?? I think a brownie sundae3. What are your favorite toppings for pizza? ?-any meat, all veggies and believe it or not i love anchovies4. What are your pets names? ?-Mr Snuffalufagus or Snuffy to most of us.5. What did you have for breakfast today?? i had what they call a protein cookie and raspberries. For the cookie the night before you take oats, protein powder, peanut butter and some almond breeze and make into a giant cookie shape, put into the fridge and voila a brekkie in the morning.